Green building can be complex in its details but it is simple in its basic concept. The goal is to preserve, and where possible, improve the environment in which we live. In this context the environment includes our homes, their immediate surroundings and at the planet as a whole. 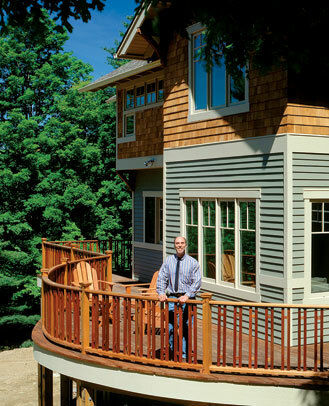 Green homes can be simple, too, or they can be built to any range of aesthetic and comfort standings. After all, green building is not a style of architecture. It is a mindset that takes in all the aspects of the design and building process. Houses consume a vast volume and variety of natural resources. They do so via the raw materials and energy used in manufacturing, packaging and transporting building products. They do so during construction. And they do so during the ongoing operation of a home. When building green, every reasonable step taken to reduce the use of natural resources is a positive step. Green building also prevents the harm that can be caused by poor indoor air quality. Heat sources, glues, paints and finishes can produce harmful gases. Humans, pets, materials and the atmosphere can add additional pollutants. Inept building practices can lead to mold. Consequently, Capital Construction, Inc. emphasizes “healthy house” construction within its green building approach. In fact, Capital Construction is the only builder in the Northeast to have built a home certified by the American Lung Association as a healthy house. Product selection: Do the building materials —from foundation to roof and everything in between— come from environmentally responsible and, preferably, local sources? Are they renewable, safe and durable? Anyone planning a new home can have a green home built along a spectrum from “light” green (simple and low-cost, but mindful) to “dark” green (more details and more green technology). All it requires to make a difference is the right mindset.